Cut turkey into eight 1 inch chunks. Cut cheese into eight 1 inch chunks. Remove the crust from the bread and cut bread into 12 one inch pieces. Cut bacon slices into 8 equal pieces. Cut lettuce into eight one inch pieces. 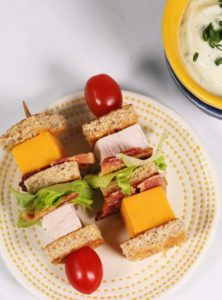 Assemble kabob by layering 1 tomato, piece of toast, chunk of turkey, piece of bacon, piece of lettuce, piece of toast, piece of bacon, chunk of cheese, piece of toast.